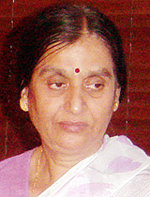 Jaya Sibu authored Mantrik Bhajan Dipika , published by Kashmir Shaktivad Prakashan, sponsored by the Foundation of Indology & Culture Ajmer, in the year 1998. This Bhajan Dipika is based on the BIJA MANTRAS of the Kashmir Shakti Agamas, covering 19 Bhajans in 52 pages. Bija Mantra is the subtle force of Shabda Sharira of the divinity in Purusha and Prakriti form or Shiva and shakti according to the Agamas. Kashmir Shaivism establishes the Bija Mantra with Para Prakriti. 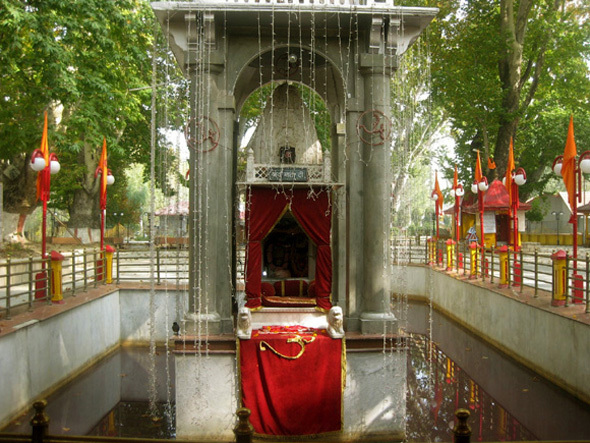 It is the Samvit Shakti of the Chakreshvara and the transforming Shakti of the sacred Kunda at Khir Bhawani Tullamulla, Kashmir. Jaya Sibu has explained the Bija Mantra and akshara through Bhakti/devotiom. The present Bhajan is based on the Shri Raginya Sahsranama, of Kashmir. But Jaya Ji has woven this Bhajan with deep sense of separation from Kashmir. This verse reflects the separation of the poetess from the roots of her birth. Chainya Bhakhtiya being the plural says that not only she had to leave but the community as a whole, who happen to be your traditional devotees had to leave Kashmir. The tears are always in the eyes, every morning and evening, for seeing the sacred Kunda of Bhawani MahaRaginya Bhagawti. She says: O Bhawani you are very much there, but your devotees are scattered every where. The word "Eiirya" in Kashmiri means going to be drowned in the whirlpool of anxities. The original poem is of 15 verses, representing the Panchadash--Akshari Mantra of the Tullamula shrine. After migration , all the persons who left Kashmir, could find their migratory settlements in the hot places, where there was dearth of water, no shade and no cool temperature like Kashmir It makes the poetess chooses the word Syeki shaaTh, which means the desert or desert like places. बनी रहे वर्त्तिका सदा स्निग्ध भाव से प्रज्ज्वल ! The verse on Tulmul is heart rendering and has come out at appropriate time of 'ZethiAathem'. In true sense, it reflects adoration and devotional love in each and every line of the verse. I, at least read it thrice and still i love to read it again and again. It gives me innate pleasure and i am sure 'Maa Ragniya' has chosen you, rightly so, to do this lovely job. Simply great job done. AorZuv Tu DhorKoath. Respected Jaya sibu ji Had this poem been wrtitten in Hindi, I would have recited it for Shehjar as well. We have heard about Tullamula, but not seen that sacred spring. I was told the meaning of this Bhajan by my Dad.